was the first British computer magazine founded by Angelo Zgorelec  in 1978, launched from February 1978 to June 2009 . 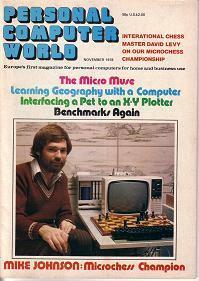 The magazine sponsored the Personal Computer World Show, an annual trade fair held in London every September from 1978 to 1989, also hosting the PCW Microcomputer Chess Championship and European Microcomputer Chess Championship as part of the show. In their early years, PCW regularly published about computer chess. This page was last edited on 28 May 2018, at 13:41.